Carl Linnaeus (Latinized: Carolus Linnaeus, also known after his ennoblement as Carl von Linné; Born::May 23, 1707 – Died::January 10, 1778), often referred to as the "Father of Taxonomy", was a Swedish botanist, physician, and zoologist. Many know him today for the system that he created to rank, name, and classify animals which is still in use today. 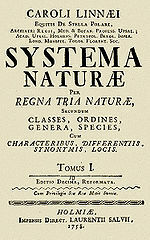 After he followed in the footsteps of his father by becoming a botanist, he wrote the first edition of his book named, Systema Naturae, which was concerned with the classifications of living things. Throughout the rest of his life he continued to make changes and revisions to this book to make it more up to date. In 1727, he moved to Lund to study medicine. Here, he devoted his life to natural history as well as the study of medicine. As he lived his life, he started to make a rather large collection of items that he considered special or significant. In 1766, he became concerned for these collections because of a big fire that had occurred. He became so concerned that he built a museum to shelter all of his belongings. 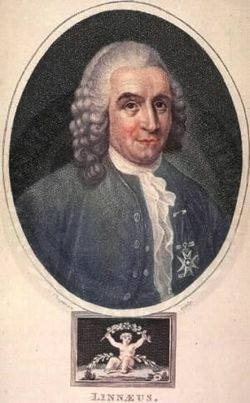 Carolus Linnaeus accumulated many accomplishments throughout his life, with one of the main ones being that he was one of the founders of the Royal Swedish Academy of Sciences. He was also pivotal in the creation of the Celsius temperature scale. Linnaeus deeply loved nature, and was always in awe when looking at the world of living things. One of Linnaeus's greatest pieces of work was the botanical garden which he created in Uppsala, which can still be seen today. Linnaeus's religious beliefs mostly were dependent on natural theology. In many of his statements he talked about God's divine order. ↑ Godfray, H. C. J (March 15, 2007). "Linnaeus in the Information Age". Nature (Nature Publishing Group, Macmillan Publishers Ltd) 446 (7133): 259. ISSN 0028-0836. This page was last modified on 19 April 2016, at 20:45.